Laurel hedging (Prunus laurocerasus Rotundifolia) is a fast growing bush used widely as an evergreen hedge and valued for its dense growing habit. 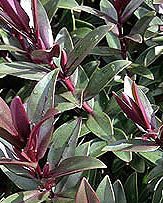 Glossy attractive foliage and tolerant of damp and shady positions. Laurel will reach a height of 4-5m but can easily be pruned to maintain a more formal shape. For a dense hedge plant at a distance of 1/2m centres. 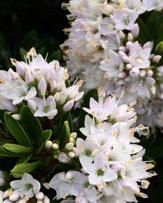 Laurel Hedges will grow in part shade to full sun and are easily pruned to make a nice formal tall hedge. Sold are bare rooted plants, root balled and as potted plants. Laurel Hedging can be grown in a container, with some limitations. As it is fast growing it can quickly 'outgrow' a container, and although its growth will be a little restricted it will perform satisfactorily for a number of years. You will need to prune container grown plants to keep them at a reasonable size. Laurel hedging is generally forgiving when it come to pruning, however it is best not to prune them in autumn in the UK. The pruning will encourage new growth and this is tender and susceptible to damage from cold and frosts. So spring to early summer is the best time to prune. 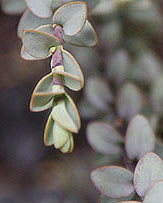 Pruning in late summer will help keep plants at a smaller size. Laurel hedging should be planted at around .5 - .7m (18 - 24 inches) if you wish to create a good dense tightly knit hedge. Prunus laurocerasus rotundifolia is a tough evergreen hedge that will reach well over 4m and is easily pruned. Well suited to drier areas. More Hedging Plants for the UK including a wide range of hedging styles suitable for hedges in almost any situation, hedging plants include low and tall growing plants, hedging plants for shade and sun as well as flowering, fast growing and slow growing hedges. Buy Direct from the Growers - FREE delivery over ��50. Huge discounts on orders over ��300. Privet, Yew, Escallonia, Griselinia, Laurel, Beech, Hawthorn, Box, Hornbeam, Lavender, Holly, Lonicera, Photinia, Thuja and many others - plants from 30cm to 3m plus. Hedging, topiary shapes and much more. Nationwide delivery available. Hedging plants to gardeners, farms and estates. Privet, beech, blackthorn, guelder rose, hornbeam & yew. Mail-order specialists and growers of bare-root hardy trees and shrubs since 1950. Evergreen hedging, Laurel, Leylandii, Castlewellan Gold, Taxus, Thuya and Box hedging. Larger sizes upto 9ft. 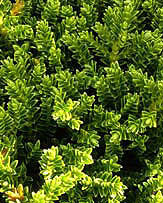 Wide range on hedges & plants available online. Selling trees and scrubs mail order for over 15 years. Specimen & ornamental bare root & container grown trees, shrubs, hedging and fruit trees. Wholesale / Retail .